We open with Woo Joo returning to Sakurai’s office with a determined step. 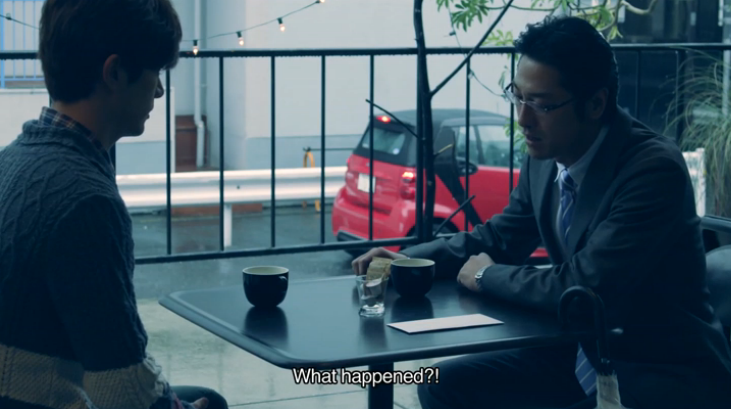 He apologizes for being late and Taka angrily demands to know where Woo Joo has been. Woo Joo apologizes again and asks where Sakurai is. Taka says he waited as long as he could for Woo Joo, but had to leave. Any luck on finding the watch? None. It wasn’t mixed up with the samples at the office either? Nope. Taka says that it could still be a mistake on Sen’s part, so it’s best not to panic and wait and see what happens. Taka then says Woo Joo seems too relaxed about the situation. Woo Joo apologizes for this as well and promises to pay for the watch himself if they cannot find it. Say what? Taka then says he is only saying this since he knows how much Woo Joo gets paid. There is no way Woo Joo could possibly work off the watch in a year. Youch. It must be SUPER expensive. Taka then says stylists just don’t put clothes on models. It is a stylist’s job to protect the model and create a sense of solidarity between the model and the photographer. Woo Joo’s biggest mistake is not thinking of the model like he should have been. A true pro is one who works diligently to quietly support the model even when they are not in the spotlight. I don’t think Woo Joo was focusing too hard on himself, but yeah, he should have been extra careful when the model told him to look after that watch. Taka says it’s not about the money, Woo Joo needs to repay them with his best performance. Taka smiles and says or something like that. It’s time to stop moping and work hard. Uh…that was SO not very inspiring, but Taka was doing his best, so props to him for trying. We cut to Woo Joo packing and having one of his inner monologues. Turning points in life always come about unexpectedly. He knows he shouldn’t go against his values to do something, and it’s not like he wishes to make such a crazy decision. He continues packing his bags and says that he will do whatever it takes to win over this situation, even if it is the wrong direction he should take. What is that boy planning? He then takes out the necklace he had bought for Luna long ago and recalls their conversation about the probability of car accidents and leading a sad life. Luna comes home and finds Woo Joo finishing up his packing. Is he staying out overnight? Or does he have a location shoot? Woo Joo doesn’t answer this question and only says he’ll probably be gone for a while. Luna doesn’t like the suddenness of this. Woo Joo apologizes and says he’ll be staying at the office for the time being. This doesn’t have anything to do about the watch, does it? Woo Joo says of course not. He then apologizes for causing such big trouble for his company and Pistol Star. He then says they are so busy right now that if he’s not at the office, nothing gets done. Luna calls him a liar. He’s not seriously thinking of taking on this responsibility by himself is he? Woo Joo says he isn’t. Before he can say anything more, Sung Jun comes in and asks the same questions. Woo Joo clams up and takes off with Sung Jun asking what happened. Luna then rushes after Woo Joo who takes one last look back at Blue Moon House before walking away. She comes up to him with head bowed and says she is really worried. He’s going to come back, right? Woo Joo keeps his back towards Luna and slightly nods before giving an affirmative grunt. Luna turns to go back inside and Woo Joo turns and pulls her into a hug. Don’t worry. He will always make sure he’s by her side to hold her. At Star Asia Corporation, Kei is busy packing up his desk when Iga comes in. Kei says he has some nerve. 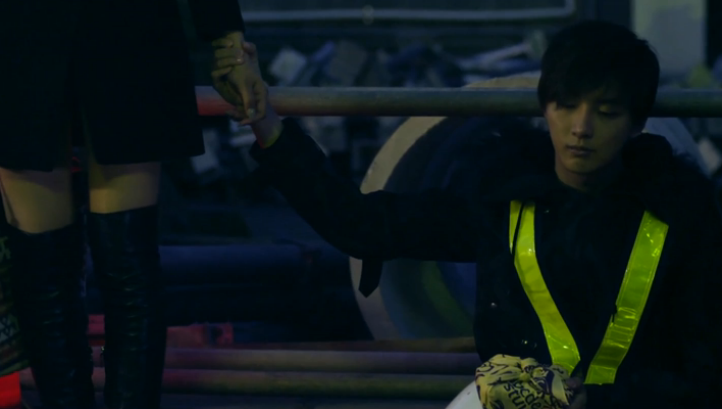 Iga pleads for Kei to save him and take him with him. Kei says that this is all Iga’s doing thanks to his loose lips. Plus, Kei is at no position any more to help anyone out. If Iga wants to hate someone, he should hate Ren. 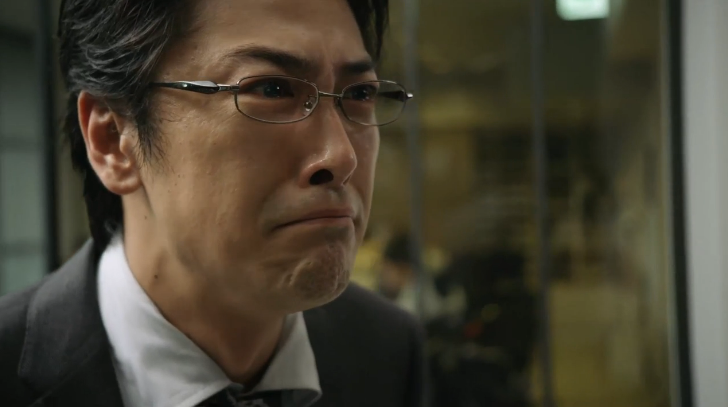 Iga’s face crumples into something very ugly. Meanwhile, at Pistol Star HQ, Luna says that Numero’s stance is to do a re-shoot just in case the advertisement is canceled. Sakurai has also agreed to this. Abilio says there is nothing they can do except move as fast as possible. He knows Sen isn’t the type to normally say anything, but to lose such an expensive watch. Abilio then says he feels bad for Cherry’s (Sakurai) sudden string of bad luck. Misaki says there is nothing to feel sorry for as this is an obvious case of stylist negligence. 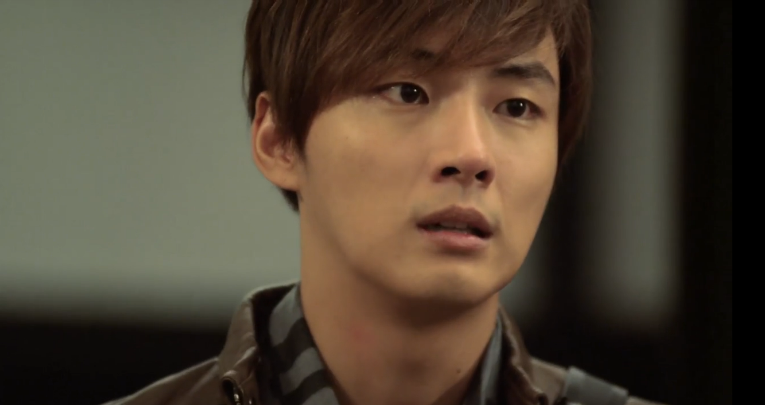 Misaki then reveals that Ha Woo Joo was requested to be fired. Misaki would have fired him even before that request since he’s obviously not cut out for this job. Abilio calls her scary and cold. Luna cuts in and tries to bring things back to the subject at hand. Her idea is to do a promotion with Instagram. There are overseas brands who invite power users (of Instagram) with over 10,000 followers to special events to take real-time pictures and updates. So what exactly is Luna planning? They should invite power users to the fashion event they are planning with Numero. Luna goes into a very detailed description of the plan to invite major movers and shakers in the fashion world and have photos taken in the press room to be uploaded via Instagram for a fast, quick ad campaign where users will have the ability to vote. Misaki cuts her off and tells her to quickly contact Ako. What about the plan? Abilio says success can come out of failure. Meaning, they are okaying Luna’s idea. Enter Woo Joo. He is there to make the returns of their good. Luna excuses herself to take care of the matter. Woo Joo tells her he sent her a mail with the item list for an upcoming shoot. If it looks okay, then he’ll forward it to the editor. Luna promises to look at it and then says he looks worn out. Is he doing okay? Woo Joo assures her he’s fine and then says he’s in a hurry. He then takes off and Luna looks after him pouting. If Woo Joo continues on this way, he’ll collapse. On his way out, Woo Joo runs into Ren and his assistant. The assistant goes down first, leaving the two alone. 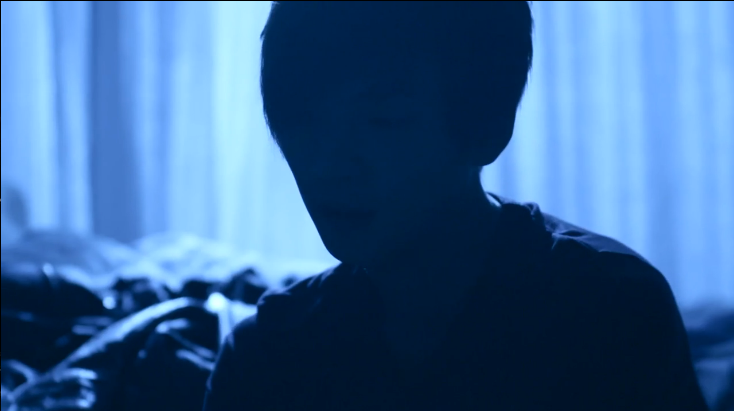 Woo Joo goes to leave and Ren says he put an end to everything so Woo Joo needs to take care of Luna. Woo Joo says that he heard Ren is leaving Pistol Star. Only to go back to HQ. He’s here today to say his final farewells. Woo Joo asks if its okay that Ren doesn’t say anything as Luna won’t understand. Ren’s reply is that some things are better left in the dark. That is true. Woo Joo says nothing to this and just walks out. Ren, dispiritedly walks to the balcony to look below. After work, Ren waits for Luna. He assures her he just wants to say goodbye. Once he returns to Star Asia HQ he will be at the bottom of the totem pole surrounded by people jockeying for positions. Then he’ll probably be sent overseas for a year or more. Who knows when they will be able to meet next. Ren’s looking for to it. Luna smiles and says that Ren had better make sure to attend the Christmas Eve event with Numero. Ren says that he wouldn’t miss it as it’s the last time he’ll be celebrating Luna’s birthday. Luna thanks Ren for recommending her to Ako and says that she’s getting better about distance and building relationships. It’s slow, but Luna finally feels she’s headed in the right direction. Ren smiles and tells her to hang in there. Is Luna going home? No, she’s got somewhere else to go. Ren tells her that he’ll take wherever she needs to go since this will probably be the last time for him. And now I’ve got Luna’s car accident statistics in my head. Luna and Ren are stopped at a red light where there is construction. Luna stares at Woo Joo who is working. The light goes to green and Ren goes to take off, but Luna demands he stops the car. Ren slams the brakes and Luna goes to jump out. He stops her. If she goes out now, she will just hurt Woo Joo’s pride. Pride? What does that matter when Woo Joo is working himself to death? Ren says he doesn’t know the reason, but Woo Joo must have one to be doing this. It’s best if Luna pretends not to see him. Luna does listen to Ren and doesn’t go out. She then says that Woo Joo is such an idiot. Woo Joo heads back to Sakurai’s office. It’s now 6 AM. He looks completely tired, but he goes right work. That boy is going to collapse soon at this rate. He does end up taking a bit of a nap and gets up again at 8. He sluggishly gets cleaned up and does his best to get back to work. Woo Joo goes off to make deliveries and Taka warns him to be careful driving since he hasn’t been sleeping well. Woo Joo assures him he’s okay and leaves. Taka then mutters to himself that no one would believe Woo Joo’s fine and he should be careful. Again, Luna’s words in my head. I hope there isn’t an accident. It clouds up and starts raining. Woo Joo pulls up outside a café where he sees Iga and Sung Jun meeting. Sung Jun is refusing Iga’s envelope of money. Iga wishes to know why, but Sung Jun won’t tell him. Woo Joo remembers Iga meeting with Ren. 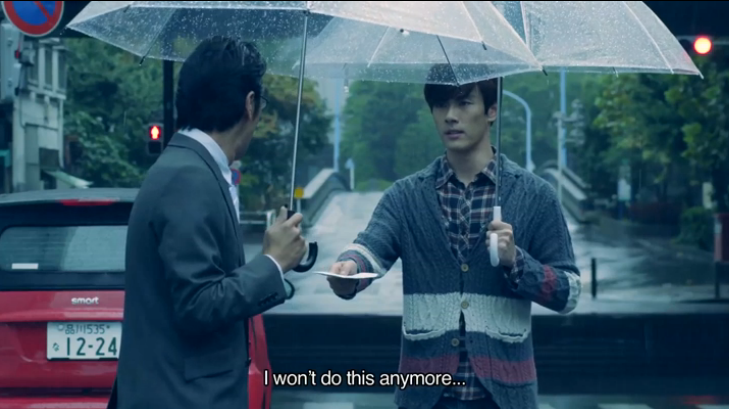 Iga then pushes the envelope back at Sung Jun telling him to just do it and takes off. Sung Jun takes the money and rushes after him. He hands it back to Iga. He just can’t do this any more. Iga reminds him about needing money for his sister who’s currently studying at the famous Sungkyunkwan University in Korea. Sung Jun should remember he’s not the only one at stake. Sung Jun says that while he does need money, he can no longer do this anymore. 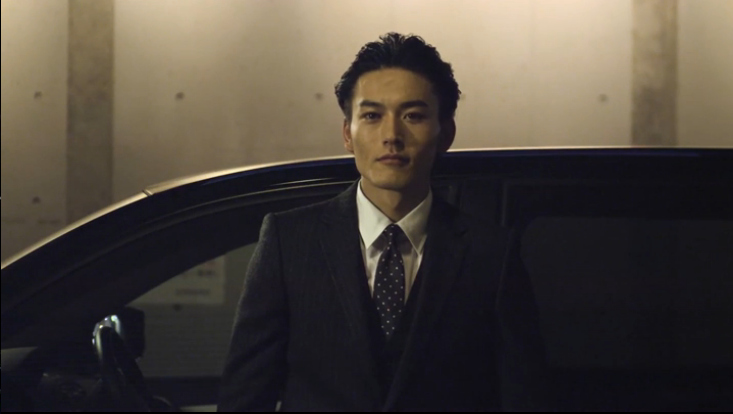 He shoves the money back in Iga’s hand and walks off. I’m proud of you, Sung Jun. Luna is busy working when Taka shows up instead of Woo Joo. Luna asks what is going on and Taka says he’s filling in for Woo Joo. Luna then screws up the courage to ask about Woo Joo. Taka reveals that Woo Joo is working nights to pay off the watch. The amazing thing is that Woo Joo’s work during the day is still flawless. Taka believes he’s only getting a few hours of sleep a day. They won’t say anything or stop him since Woo Joo hasn’t slipped up once. Taka really admires and respects Woo Joo. There is no way he can win against him. At the construction site, Luna comes up with food while Woo Joo is taking a brief break. He asks why she’s there that late. Luna says that’s her line and shoves the food at him. She then says she made the food herself. Woo Joo takes it and Woo Joo tells her to quickly go home since it’s dangerous at night. Luna says she will make him bentos every day. Woo Joo says that isn’t necessary and Luna scolds him for being stubborn. Woo Joo then says he doesn’t normally have time to eat, so this is a lifesaver for him; however, he will only take it this one time. Luna then tells him about the event on Christmas. Woo Joo needs to make sure he comes. Luna reveals the tie-up with Numero was officially cancelled. It was Pistol Star who did the cancelling since they said Luna’s plan was much more interesting. Luna goes to leave, but Woo Joo stops her by grabbing her hand. It’s almost light out. Woo Joo would prefer it if Luna left then. Awww. Luna squats back down and Woo Joo holds her hand. He then says that after the event on Christmas Eve, they should go out and celebrate Luna’s birthday. Luna nods. And Woo Joo laces his fingers through hers. The two then smile. Awwww. They are sooooo cute together. Morning comes and Woo Joo is bringing in a rack of clothes to Sakurai’s. Sakurai asks if this is the last load. Woo Joo says it is and Sakurai looks through them and pulls out a particular coat. He doesn’t recognize the items—are they from different brands? Woo Joo says that they are all from new brands with only a few pieces to their names. These brands were started by a younger generation of designers who had worked for major companies overseas. Sakurai is impressed and tells Woo Joo to tell him more later. Sakurai goes to head into the office first and Woo Joo smiles happily. He waits for the freight elevator when he gets a phone call from Sung Jun. I don’t know what happened, but Woo Joo immediately agrees to rush off. Something’s wrong. We’ll have to wait until next week to find out, though.